The sixth round of the 2014 F1 season is upon us already, and it's a cracker. The Monaco Grand Prix is a highlight on the calendar, not because of the glitz and glamour, but because of the glory of such an iconic location and a track filled with illustrious history. Stay on top of the action from the street track as the logbook follows the session progress, the paddock gossip, plus the winners and losers from the weekend. Hello, welcome to a brand new logbook for the Monaco Grand Prix, the one-stop shop for all the coverage from this weekend's F1 race you'll ever need. Links, quotes, photos, results and more... if it's happening, we're talking about. 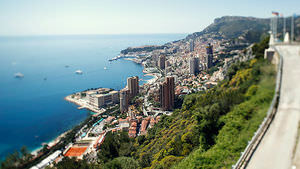 The Monaco Grand Prix is, of course, a supremely popular event for the unique track, the guest stars, the general atmosphere and the iconic history. It doesn't always deliver good racing, but what it lacks in overtaking, it makes up for in other ways. Let's start at the very beginning, which I'm told is a good place to start. If you want a round up of all the information for this weekend, including dates and times, weather forecasts, as well as who will be in the press conferences, check out the race information thread. You might think this would be the time to show a glorious sunny picture of the beautiful Monaco, but no. We're going straight into Food Watch. It's not cake this week, but pizza, as Nico Rosberg showed off his cookery skills to the lovely Tanja from Sky Germany. Nico is hoping to get back in front of Mercedes teammate Lewis Hamilton this weekend, as Monaco is his home race and the driver reckons he could do with a bit of luck. Hear a sixty second round-up of his thoughts here. In other F1Minute news, Red Bull have been asked to sort out the camera housing on the nose of their car. The sneaky devils were getting away with their aerodynamic design but now the FIA have requested they abide by the regulations. Prepare your heart strings for the sight of a lonely truck. Caterham have left behind one of their motors, as per @JoeIrishF1: Poor old RT1... left back at base as she's not needed at #monaco. Normally base camp for the engineers. Not sure if it's really not required or if the Monaco pit lane/paddock is just too tight a squeeze, but either way, poor truck! During the press conference yesterday, Valtteri Bottas discussed the benefits of coming into Monaco with a year of experience under his belt. "Definitely it was really tough last year, first time, immediately with a Formula One car but, you know, you just need to adapt to it, you need to build the speed up step-by-step in the practice. "Definitely going for the race this season I know the track well now, so it's much easier to approach the weekend and build from practice one onwards." This year's rookies Magnussen, Ericsson and Kvyat will have their work cut out for them then! Daniel Ricciardo has shared a few photos of his new helmet design this weekend. It's similar to the original, but a little more glittery and a lot more gold. I assume the big MONACO is in case he gets confused which track he's at and needs a reminder. Free Practice gets underway today, Thursday, because you know, Monaco likes to do things differently. If you're watching any of the action, do join the live thread for spirited conversation! @JennieGow has captured a glimpse of the new camera mountings on the Red Bull car. The first session saw drivers taking to the track tentatively, with Anthony Davidson describing the cars this year as similar to driving in the wet last year - lower downforce, etc. Adrian Sutil ended the session at the hands of the marshals, but he wasn't the only one struggling. Sauber teammate Esteban Gutiérrez also spun off, as did Max Chilton and Fernando Alonso. Between the two Free Practice sessions there were rain storms and even hailstones which meant it was a quiet start to proceedings in the afternoon. In fact, it was about 45 minutes in before anyone set a lap time. Nevertheless, by the end of the day Alonso was leading with Hamilton just behind. The rivalry at Mercedes continues to ratchet up a notch with each passing day. Now there's talk of bosses at the team asking previous champion Alain Prost for advice. I'm not sure he's the first person I would think of for hints on harmonious teammate relations, but perhaps they're asking him what NOT to do. 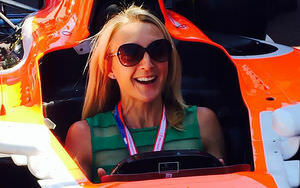 Paula Radcliffe appeared in the paddock in Monaco, along with Radio 2 DJ Chris Evans. The pair were representing Children in Need, and both got the chance to sit in Max Chilton's Marussia. As Max said: "Paula disappeared when she got into it." Tooned is back this weekend, with Kevin Magnussen making his cartoon debut and Tony Stewart returning to make a pretty impressive trio. Last year's series didn't exactly hit the right spot for me and many, but this Mobil 1 episode looks as though it's back to the good stuff. The Monaco weekend also sees the return of the Amber Lounge Fashion Show, a twice-yearly event held to raise money for various charities. It's also a chance to see the F1 drivers, partners, and team members dressed to impress, including Jules Bianchi, Marcus Ericsson, and Esteban Gutiérrez. Also Justin Bieber. Who is not a driver, partner or team member, but was also there. Ahh, here's the full line up of F1 driver representatives for the Amber Lounge fashion show, suited and booted in their Sunday Friday best. Final practice was completed this morning in the glorious Monte Carlo sunshine. Mercedes were still on top, but they were pushed a little bit by Red Bull. Full results here. Pixie Lott, who performed at last night's Amber Lounge show, showed up in the pit lane for today's qualifying. Caterham's head of communication's Tom Webb grabbed her for a quick photo. Qualifying turned out to be something of a controversial one. If you want to catch up on any of the action from Monte Carlo, then check out the lap by lap highlights. Rosberg's actions at the end of the session - running off track and causing yellow flags which in turn secured his pole position - have raised eyebrows all round. Conspiracy theorists claim a deliberate action, and the stewards are reportedly looking into it. Will the data be able to prove it one way or the other? Tweet from @alanbaldwinf1: I think I've got this right. The FIA are investigating whether to investigate Rosberg's quali incident. Apparently, it's as simple as that. Christian Horner still thinks that most of the gains that Red Bull can make will be down to engine supplier Renault, rather than their own design department. He says: "Well, we do bring something new at every race, but the most significant thing will come from Renault’s side and with Total because the fuel seems to be a big thing as well this year. They will be our biggest single gains, but as I just said, at every race we are developing the car to try and extract more performance from it." Marcus Ericsson collided with Felipe Massa during qualifying today, with the Caterham driver failing to brake in time to avoid clashing with the Williams. He's been penalised by the stewards and will have to start from the pit lane, with a couple of penalty points thrown on his licence for good measure. The stewards were also looking at an incident between Daniil Kvyat and Pastor Maldonado. We didn't see it, and neither driver was particularly sure what had happened. The stewards are now seeing things their way, with just a reprimand for Kvyat and no other sanctions. Finally, there is no further action on Nico Rosberg and his yellow flag incident. Not sure that will placate Hamilton though! The starting grid now looks something like this. Pretty much the same as before! The starting grid has been updated again, this time because Jules Bianchi has taken a five place grid drop for a gearbox change. You can join in the live conversation about the racing action today, and there's bound to be some, right here on Sidepodcast. Incredible race today in Monaco, and we covered every single lap of the action. If you want a quick reminder, or to peruse the race at your own pace, check out the FBFB highlights. The race results were confirmed with Jules Bianchi's additional penalty seeing him drop down from 8th to 9th, but that's still in the points! Huge celebrations for Marussia this evening, I reckon. You can see Bianchi's debut on the points board with the driver standings, and Marussia moving up to ninth place ahead of Sauber in the team equivalent. Make sure you grab the opportunity to cast your vote on the race today, as well as picking the driver of the day. Romain Grosjean picked up some points this weekend, which was good news for Lotus after Pastor Maldonado failed to start the race. Romain describes his afternoon's work, though: "The safety car timing didn’t help us as we’d just gone out on the new tyres, but that’s Monaco. You can have thousands of misfortunes in the race, but still be in the points at the end!" Caterham must be inwardly fuming that Marussia beat them to their first championship point in Formula One. Maybe not quite so inwardly, actually, as team principal Cyril Abiteboul says: "Everyone knows Monaco can be a crazy race, and today it was so. It’s a funny feeling because even though this equals our best ever finish it still feels like we had the chance to score our first point"
Most drivers opted to one stop around the streets of Monte Carlo, with Felipe Massa completing more than half the race on his first set of supersofts. Pirelli were expecting durability, but perhaps not this much, they say: "Tyre wear and degradation was not an issue, as we saw from the very long stints completed by some drivers even on the supersoft, and the fact that most drivers completed just one stop. The tyres on Grosjean’s car, for example, still had 20% of their rubber left despite having completed more than 50 laps." Max Chilton has been given his first reprimand of the season, being found to have caused a collision with Kimi Räikkönen whilst unlapping himself. The contact effectively ruined Kimi's race as the Finn had to pit immediately afterwards. Meanwhile, Kimi Räikkönen himself has also picked up a reprimand, his first, for the misjudged overtaking move on Kevin Magnussen that saw them both crawl to a halt at the hairpin. Everyone knows that Monaco gets busy during race week and at the weekend, but there's a great illustration on the two before and after maps here. The boats pile in for the race, and then disappear again afterwards. Tweet from @TonyDodgins Good line from Graeme Lowdon at Marussia: "Trust us to score our first points in Monaco - we can't afford to celebrate..."
One action packed Grand Prix handily summed up in exactly sixty seconds, just for you. After a simple racing mistake ended his and Sauber's chance of their first points of the year, a somewhat crushed Esteban Gutiérrez shared his dismay via Instagram this evening. "One of my most painful mistakes, but I will never give up!!" To help fully digest what happened over the weekend, why not try reading Adam's round-up of the best performances? Insight includes: "Massa ran fifth until his tyres gave up and he dropped out of the points. But the Brazilian drove flawlessly and benefitted from others’ misfortune and was up to seventh by the time the chequered flag flew, an impressive recovery from a disappointing Saturday." There's also a selection of tidbits from the Monaco madness in the latest pick and mix edition, with Rosberg's preparations, Vettel's struggles and the FIA's number numbness. That about wraps up our Monaco coverage. A pretty epic weekend all things considered, and plenty to tide us over for until the next race in Canada. Thanks for following along, and as always, stay tuned to Sidepodcast for more fun and games between now and then. Back soon!